Midlands One East continued to provide a young Melton RFC First XV with a steep learning curve as they fell to another heavy defeat at leaders Paviors on Saturday. The team once more showed plenty of promise, enthusiasm, commitment and honest endeavour in this tough run of fixtures, but during a run of losses, nothing seems to go your way. Every 50-50 decision seemed to go to the Nottingham side who played some excellent rugby, while the bounce of the ball also favoured the home side. However, to Melton’s credit, despite all of the rotten luck they made a real contest of the match in which Paviors expected to put 100 points on the visitors. During the first half Melton defended really well, especially through Nick Crossland who had a storming match, carrying the ball well in the loose and tackling anything that moved. Jack Forfar, Sam Dennison and Dan Evans were also in the thick of the action, while the back three of Jack White, Will Garnett and Aiden Smith are raw, but full of surprises in attack while extremely brave in defence. Paviors opened the scoring after five minutes out wide from a lineout, but took another 20 to score again to lead 12-0. 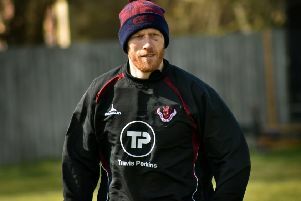 Melton turned down two kickable penalties in favour of the lineout, but without reward as they forced themselves back in the contest through Leon Gormley and Klay Radford. Great defence kept the hosts at bay, but a miss-pass bounced kindly for the home winger to score right on the stroke of half-time for a 17-0 lead at the interval. Melton rang the changes for the second half, using Jordan Pawley’s brother Luke and Dave Meakin to accompany Tom Allen in the front row, and all acquitted themselves well. Harvey Green and James Cavanah added some urgency to the attack, but were powerless to stop two long-range tries following attacking Melton lineouts deep in the Paviors 22. Leading by 31 points, the hosts threw everything at Melton and half-backs Archie Hutchinson and Chris Rose received most of the ball going backwards or attached to a Paviors player. Despite their talents, they were powerless to prevent two more scores under the posts. And as Melton’s luck deteriorated, with two players harshly sinbinned, the floodgates opened and the hosts ran in three more tries to give the 58-0 scoreline a margin which exaggerated the difference between the teams. Melton are coping well as a young team as they look forward to their next challenge, a home match with Peterborough on Saturday (ko 2.15pm).